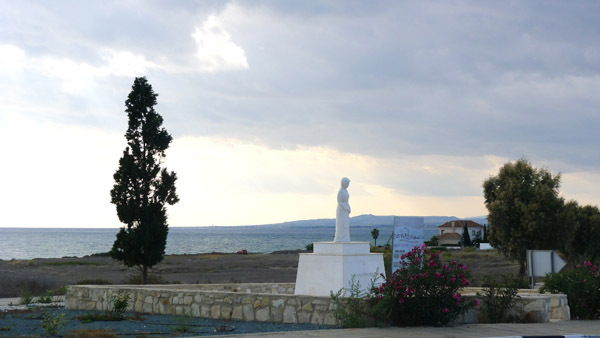 The initiative for the memorial was taken in 1992 by the “Markos Drakos” association and initially it was dedicated to all dead and missing from Agios Pavlos and Agios Dometios areas. In 1996 a decision was taken for a liberty statue to complete the commemoration. 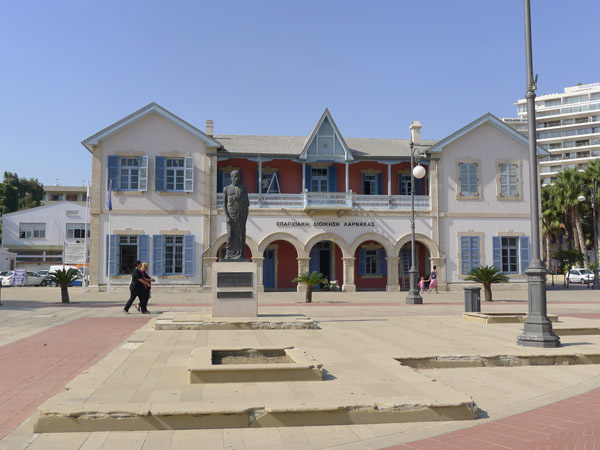 Donators of the statue, among others, have been the Archbishopric of Cyprus, Agios Dometios Municipality, Agios Dometios Cooperative Savings Bank, the Ministry of Education and Culture, the Ministry of Interior Affairs, and Kykkos Monastery. The unveiling took place on May 2nd 1999. 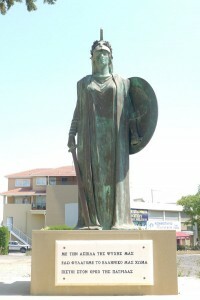 Goddess Athena stands motionless on her pedestal. A strong neck supports her head, and her facial traits (identical to those of Koili village bust, Pafos district) appear more masculine than feminine, despite her long hair and the female hidden curves emerging beneath the heavy long chiton. In spite of using the most well-known hallmark of the goddess Athena (her helmet) the statue is explicitly identified as Liberty. In addition to that, the placement of the laurel wreath on Athena’s helmet is not a familiar aesthetic formulation or visual symbolism for the goddess, but a direct way to highlight her subsequent association with heroic endeavor. An embossed letter K on her shield allows further connotations and associations. The inscription on the low pedestal under her feet declares explicitly the devotion of the fighters to motherland: “Using our soul as a shield we safeguard the Greek soil, faithful to the oath for the motherland” (Με την ασπίδα της ψυχής μας εδώ φυλάγομε το ελληνικό μας χώμα πιστοί στον όρκο της πατρίδας). A saying of Odysseus Elytis on the right hand side of the pedestal elaborates the previous inscription “We believed in our steps. We experienced our steps. We called our steps worthy” (Πιστέψαμε στα βήματά μας / ζήσαμε τα βήματά μας / είπαμε τα βήματά μας άξια). ~ Κρατικό Αρχείο Κύπρου, Αρχείο Πολιτιστικών Υπηρεσιών Υπουργείου Παιδείας & Πολιτισμού (State Archive of Cyprus): 268/1968/14, documents October 27, 1995; March 20, 1996; November 20, 1996; November 25, 1996. ~ Κρατικό Αρχείο Κύπρου, Αρχείο Πολιτιστικών Υπηρεσιών Υπουργείου Παιδείας & Πολιτισμού (State Archive of Cyprus): 268/1968/19, document March 31, 1999. This entry was posted in Ancient Greek & Byzantine legacy, EOKA 1955-59, Turkish Invasion and tagged Ancient Greek and Byzantine legacy, EOKA 1955-59, Kotziamanis Nikolaos (Κοτζιαμάνης Νικόλαος), Nicosia district (Επαρχία Λευκωσίας), Nicosia Municipality (Δήμος Λευκωσίας) on by admin. Location: On the Larnaka Finikoudes beach walk, Athinon Avenue. Larnaka district. Kimon (510-449 B.C.) was a General and politician from Athens. In 450 B.C. 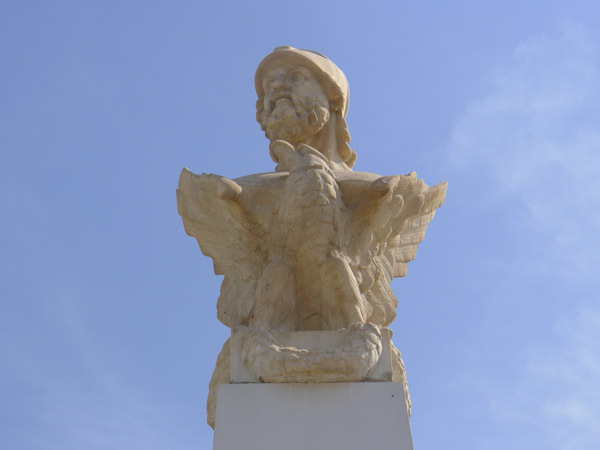 he headed towards Cyprus with the aim to liberate it from the Persians and restore Athens’ sovereignty in Aegean Sea. He died during the siege of Kition but had ordered his co-fighters to keep his death secret, which they indeed managed, for a good thirty days. During that time the Athenians won the naval and infantry battle at Salamina, Cyprus, on their way back to Athens. 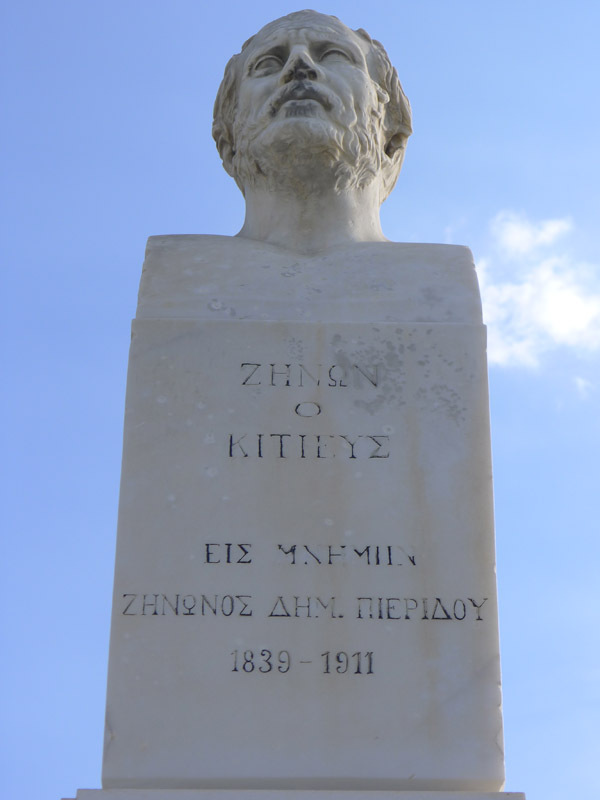 In addition to the direct connection with Ancient Greek legacy, Kimon’s bust raises another implication, based on the short note on the pedestal. The phrase “Even dead he would win” («Και νεκρός ενίκα») reminds of the historical facts, but also calls upon bravery, heroic patterns and suggests (in many levels) the power both of symbols and the ancestral memory. 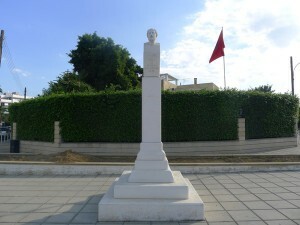 The bust was commissioned by Kition community in 1923. The unveiling took place on April 27th 1927. 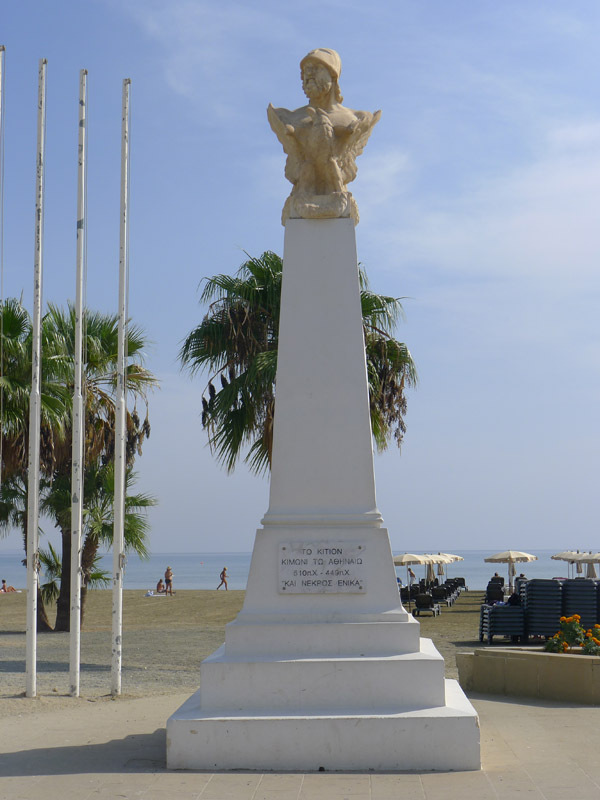 The bust was replaced in the beginning of the 1990s and the new unveiling took place on October 25th 1994. ~Αλήθεια (Alithia), September 27, 1994. 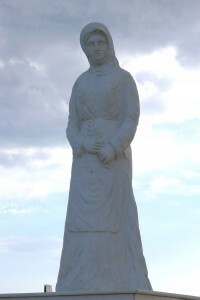 ~Απογευματινή (Apogevmatini), January 26, 1994. ~Νέον Έθνος (Neon Ethnos), June 16, 1921, p. 2. ~Νέον Έθνος (Neon Ethnos), December 1, 1923, p. 2. ~Πρωινά Νέα (Proina Nea), October 3, 1992. ~Σημερινή (Simerini), October 6, 1992. ~Φιλελεύθερος (Fileleftheros), March 17, 2002, p. 56, 57. This entry was posted in Ancient Greek & Byzantine legacy, Public sculpture before 1960, Union (enosis) and tagged Alexandropoulos Georgios (Αλεξανδρόπουλος Γεώργιος), Ancient Greek and Byzantine legacy, Kimon the Athenian (Κίμων ο Αθηναίος), Larnaka district (Επαρχία Λάρνακας), Larnaka Municipality (Δήμος Λάρνακας), Public sculpture before 1960, Union (enosis) on by admin. Location: Grigoris Afxentiou Avenue, corner to Nikodimou Mylona St., Larnaka. Larnaka district. Zinon (334-262 B.C.) 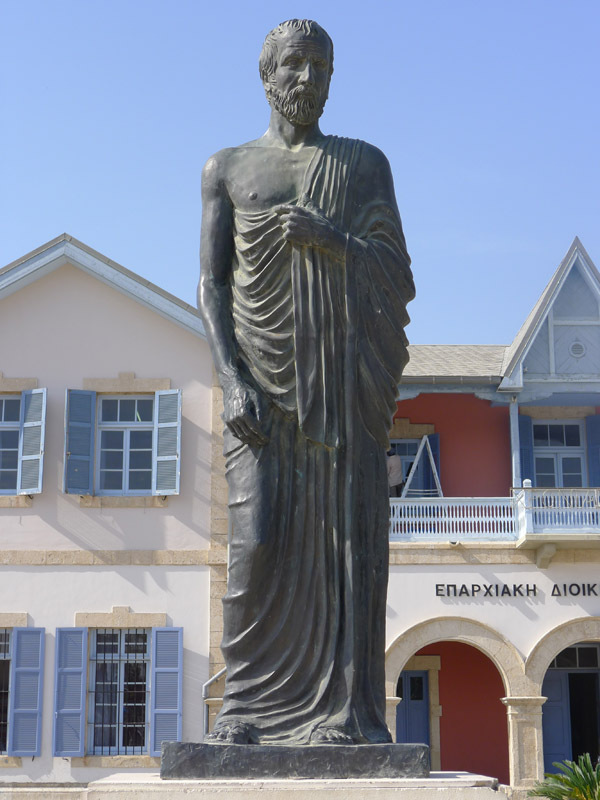 was a Greek philosopher born in Kition village outside Larnaka city. The bust was donated to Larnaka city by Zinonas D. Pieridis family and the unveiling took place on May 24th 1921. The bust was initially placed across from the American Academy. 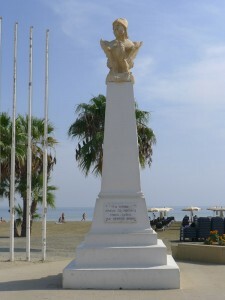 Due to the renovation of the area at the end of the 20th century, it was placed on a new pedestal and relocated close to the Municipality Garden. ~Νέος Κυπριακός Φύλαξ (Neos Cypriakos Fylax), December 12, 1934, p. 1. This entry was posted in Ancient Greek & Byzantine legacy, Public sculpture before 1960 and tagged Ancient Greek and Byzantine legacy, Larnaka district (Επαρχία Λάρνακας), Larnaka Municipality (Δήμος Λάρνακας), Public sculpture before 1960, Zinon Kitiefs (Ζήνων Κιτιεύς) on by admin. 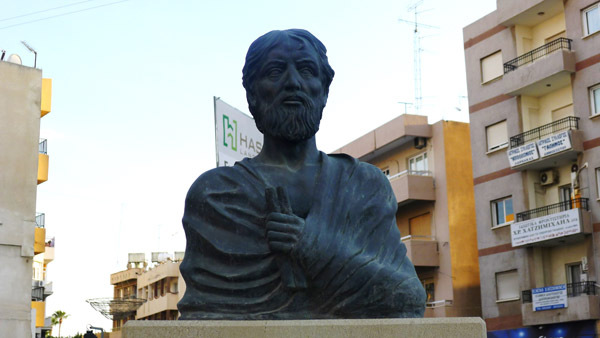 Apollonios was a Greek doctor, famous in his time, born in Kition, Cyprus, around 60 B.C. He is particularly well known for his writings on natural medicine from herbs. 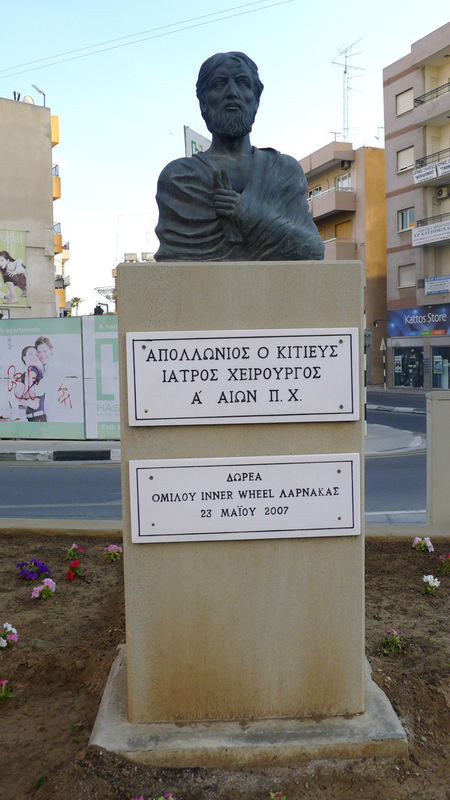 The bust was donated to Larnaka city by the Inner Wheel Group in May 2007. This entry was posted in Ancient Greek & Byzantine legacy and tagged Ancient Greek and Byzantine legacy, Apollonios from Kition (Απολλώνιος ο Κιτιεύς), Larnaka district (Επαρχία Λάρνακας), Larnaka Municipality (Δήμος Λάρνακας), Patsalos Kikis (Πάτσαλος Κίκης) on by admin. Location: Artemidos Avenue, on the roundabout, Larnaka. 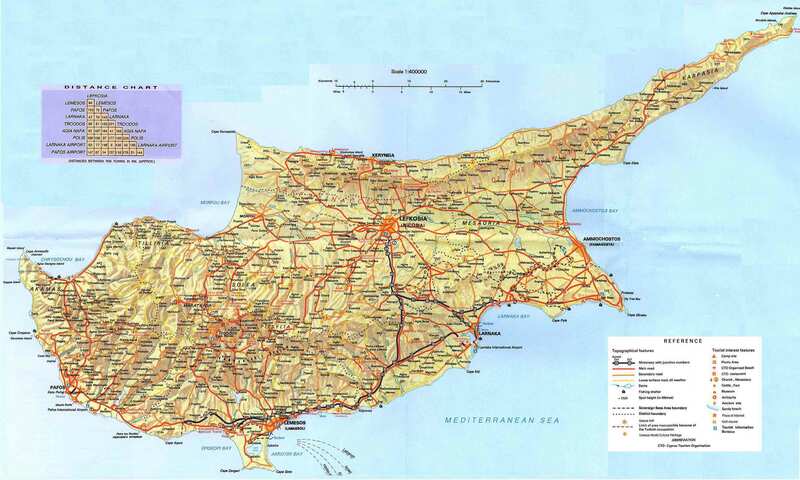 Larnaka district. 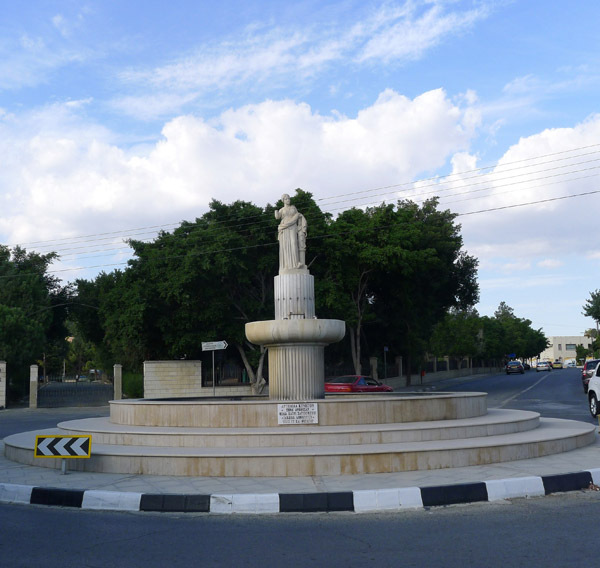 The statue was made at Carrara, Italy, and was offered to the city of Larnaka by Iakovou Dimitriou family in 1963. It is an exact copy of the original Artemis complex that is part of the permanent collection of the Vienna Art History Museum. Artemis complex was found in Cyprus at the end of the 19th century, was secretly sold to a Cypriot collector in Paris and ended up in the Art History museum. ~Μάχη (Mahi), June 16, 1963, p. 1. This entry was posted in Ancient Greek & Byzantine legacy and tagged Ancient Greek and Byzantine legacy, Larnaka district (Επαρχία Λάρνακας), Larnaka Municipality (Δήμος Λάρνακας) on by admin. 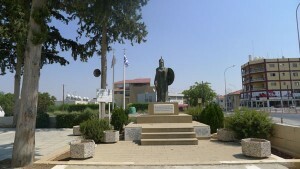 Location: Evropis (Europe) square, Athinon Avenue, Larnaka. 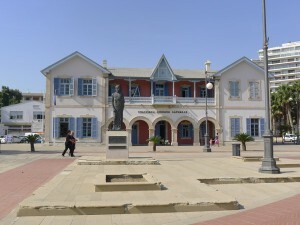 Larnaka district. Zinon (334-262 B.C.) 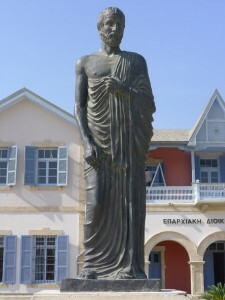 was a Greek philosopher born at Kition village outside Larnaka city. The statue is situated in a highlight location of the city, on the Finikoudes beach walk. It was commissioned by the Larnaka “Rotary” Club in 2006. This entry was posted in Ancient Greek & Byzantine legacy and tagged Ancient Greek and Byzantine legacy, Larnaka district (Επαρχία Λάρνακας), Larnaka Municipality (Δήμος Λάρνακας), Patsalos Kikis (Πάτσαλος Κίκης), Zinon Kitiefs (Ζήνων Κιτιεύς) on by admin. Location: Faros location. Larnaka district. 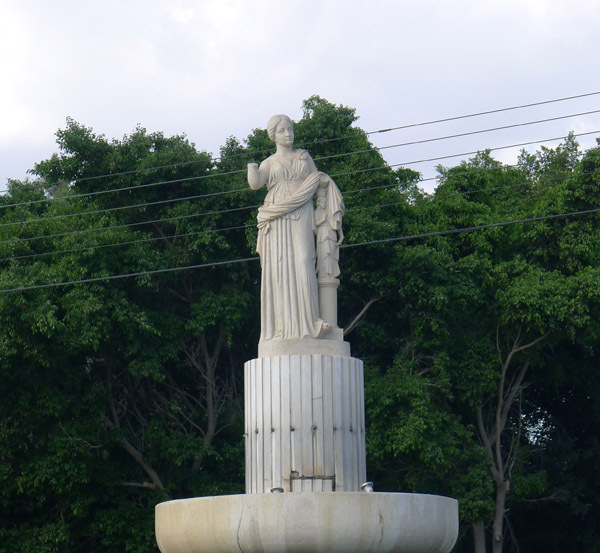 Kallipatira was daughter, sister, wife and mother of Olympic Games winners in ancient Greece. She dared to dress like a man and enter the Olympic stadium during the Olympic Games, ignoring the strict prohibition of women. Although she was caught, she avoided the death penalty because of her family reputation and mainly because her act was interpreted as prompted by motherly love and pride. The statue is an exact copy of one of the figures of the Aradippou village (Larnaka district) memorial dedicated to the Cypriot mother, and the Mother of the dead and missing memorial at Vrisoules village (Ammochostos district). All three are made by the same sculptor. The monument was commissioned by a private committee for Kallipatira monument and the unveiling took place on February 1st 2004. ~ Αρχείο Συμβουλευτικής Επιτροπής Μνημείων Υπουργείου Παιδείας & Πολιτισμού (Advisory Monuments’ Committee) 14.3.01/7, document February 10, 2004. This entry was posted in Ancient Greek & Byzantine legacy and tagged Ancient Greek and Byzantine legacy, Larnaka district (Επαρχία Λάρνακας), Perivolia (Περιβόλια), Terentis Andreas (Τερέντης Ανδρέας) on by admin.